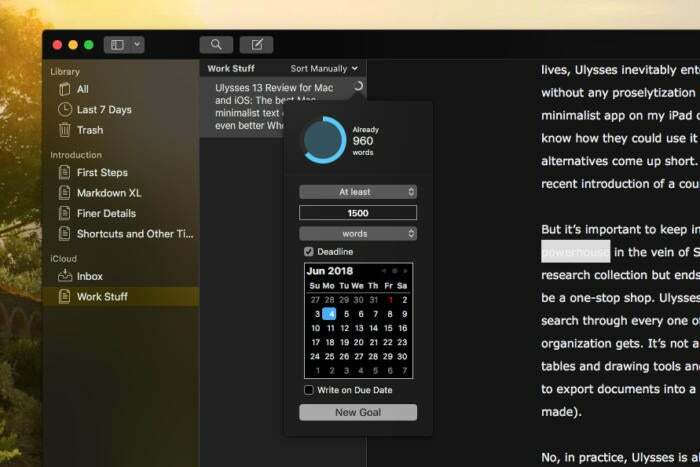 Ulysses has long been a dream app for writers, but new support for deadlines and coders make it even better. Whenever I tell other writers why they should consider bringing a Mac into their lives, Ulysses inevitably enters the discussion. In fact, this sometimes happens without any proselytization on my part: They simply see me typing on the minimalist app on my iPad or Mac at trade shows or conventions and demand to know how they could use it on their PC. But they can’t, and in my experience alternatives come up short. Ulysses is elegant. It’s intuitive. And thanks to the recent introduction of a couple of new features, it’s more useful than ever. But it’s important to keep in mind what Ulysses is. It’s not an organizational powerhouse in the vein of Scrivener, which allows for Herculean feats of research collection but ends up wallowing in ugliness in its dogged attempt to be a one-stop shop. Ulysses can organize its various “sheets” into groups with keywords and it lets you search through every one of them at once, but that’s about as complex as its organization gets. It’s not a full-blooded word processor like Microsoft Word, with its tables and drawing tools and WYSIWYG export options, but Ulysses allows you to export documents into a variety of styles (and some of them are even user-made). Better yet, you can publish your articles directly to WordPress or Medium. Adding keywords to the various "sheets" (documents) allows for further organization in the library bars to the left. In practice, Ulysses is about just you, the words, and the page. It’s about crisp white words stamping on a fullscreen sea of inky black (or white on black, if you don’t like working in Dark Mode). It’s the finest of the minimalist writing apps, and it earns that distinction in part because it allows for a single custom font for writing while still exporting to plain text. (Sorry, iA Writer, but I simply think better in 14-point Verdana.) There aren’t any confining page borders to worry about, and its resource-friendly minimalism allows new documents to launch with blazing speed, and I can shrink Ulysses the corner of the monitor while I dedicate most of my screen to the webpage I’m referencing. Traditional word processors, like Word, feel too much like drudgy busywork. Ulysses’ beauty and minimalism make writing feels more akin to creation. Compare it to Pages or Notes, and it even out-Apples Apple. 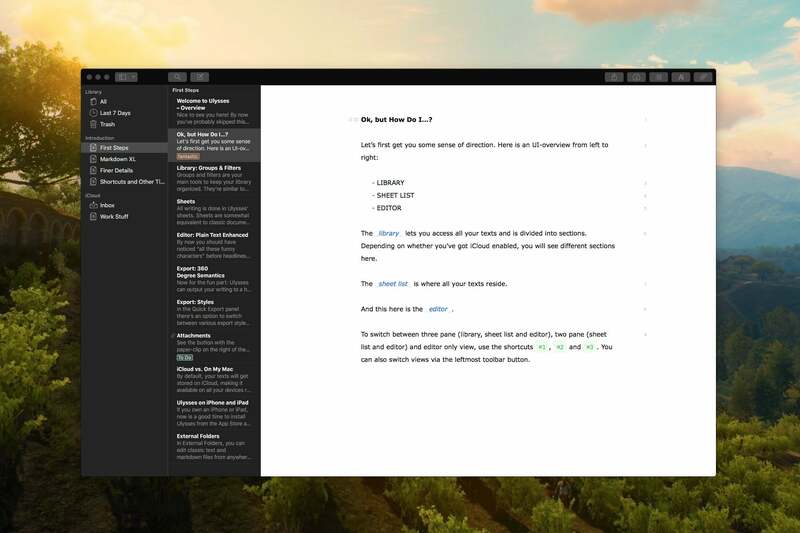 But more to the point (and down from my cloud), Ulysses is first and foremost a minimalist Markdown editor, which uses its own version of Markdown called Markdown XL. Don’t know what Markdown is? 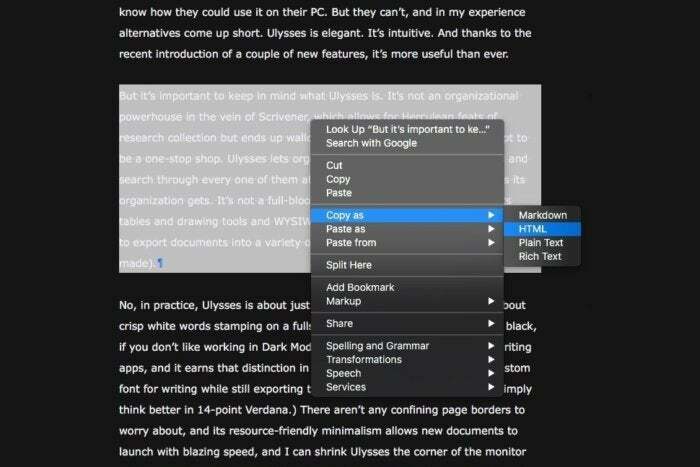 It's a simple system of shortcuts for publishing web content more easily, but you can use Ulysses entirely without it if you wish and simply paste your copy into a more featured editor like Google Docs. But it doesn’t take long to learn, which is part of Markdown’s appeal. Happily, Ulysses comes with a bundle of easily digestible sheets explaining the simple and popular formatting language for internet content, as well as a handy cheatsheet for shortcuts available through a toggle. You can learn the basics within seconds. Markdown works beautifully on Ulysses, and, blessedly, without any of the distracting visible code for hyperlinks you find in rivals like iA Writer. Converting Markdown text to HTML in Ulysses is a simple matter of selecting everything, right-clicking and choosing to copy the text as HTML, and dumping it in your CMS of choice. The vast majority of my content for Macworld starts this way. Ulysses has worked this way for years, but the latest updates make it more agreeable for coders. Coders have long liked Ulysses as much as regular writers, but in the past it was easy for the actual coding to get mixed up with the regular text with all the minimalism and Markdown going on. Now, you simply click the ` key to start a block of code, and it formats it in a monospace typeface that’s distinct from the regular text around it. For coders, at least, it significantly improves Ulysses’ usefulness, particularly as it recognizes over 40 programming languages and accurately colors their syntax. And for all of Ulysses’ apparent simplicity, you’ll find other options waiting unobtrusively in the background. There’s a word and character counter, visible only through a tiny icon on the taskbar. There’s a typewriter mode, which keeps your attention focused on the handful of words directly in front of you. You can set word count goals, and watch as a minimalist circle on the right side of your screen grows ever more full as your hurtle toward your word count. It’s elegant and satisfying. The latest patch made goals even more satisfying, as you can now set deadlines to keep you on your toes. The ability to add deadlines adds a mild dash of Flowstate-like pressure (but in a good way). So what’s the catch? The big one is that Ulysses requires a subscription of $4.99 per month, although it allows for a fully featured trial (across Mac, iPad, and iPhone) that lasts two weeks before you have to pony up. I’m still not too sure how I feel about subscription models, but in my case, I certainly use it more than enough to justify the relatively agreeable price. I find the cross-platform subscription especially useful for my workflow, as I tend to write drafts on my Mac at work and then edit them on my iPhone or iPad while lying on the couch. It usually works perfectly, but I’ve experienced some syncing hiccups and I’m not sure whether to blame Apple or Ulysses for them. 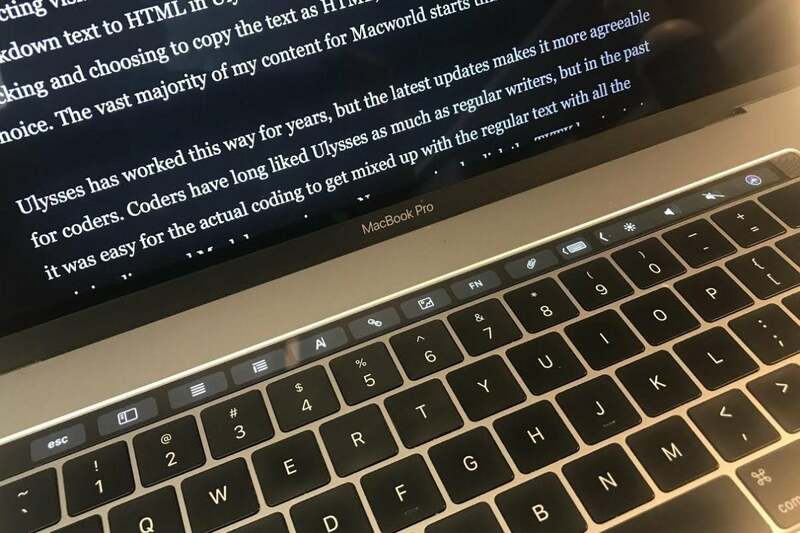 Yes, I'm gonna say it: Few if any apps understand the potential of the Touch Bar so well as Ulysses. It saves significant time, particularly in fullscreen mode. This isn’t enough to send me running into the arms of a competing app (although I consistently try out others to make sure my admiration isn’t misplaced). Ulysses may not be an Apple product, but it’s one of the best things about using a Mac, and iPhone, and iPad. The experience remains remarkably the same across each device, and it’s usually just as satisfying on each. May it stay that way for a long time to come. A wonderful minimalist Markdown text editor with multiple features and iCloud syncing.